WARSAW: US, Arab and Israeli leaders gathered Wednesday in Warsaw for a conference expected to pile pressure on Iran. The event is attended by about 60 countries and the agenda also covers the Israeli-Palestinian conflict, the fight against Daesh, Syria and Yemen. But the bulk of the focus will be on Iran, and how to curtail the regime’s aggressive foreign policy in the region. US Secretary of State Mike Pompeo and Polish Foreign Minister Jacek Czaputowicz greeted the attendees at the opening ceremony, including Saudi Arabia's Minister of State for Foreign Affairs Adel Al-Jubeir. “Especially the world's leading sponsor of terrorism: the Iranian regime that continues to destabilize our region and launch ballistic missiles against civilians,” Prince Khalid said. 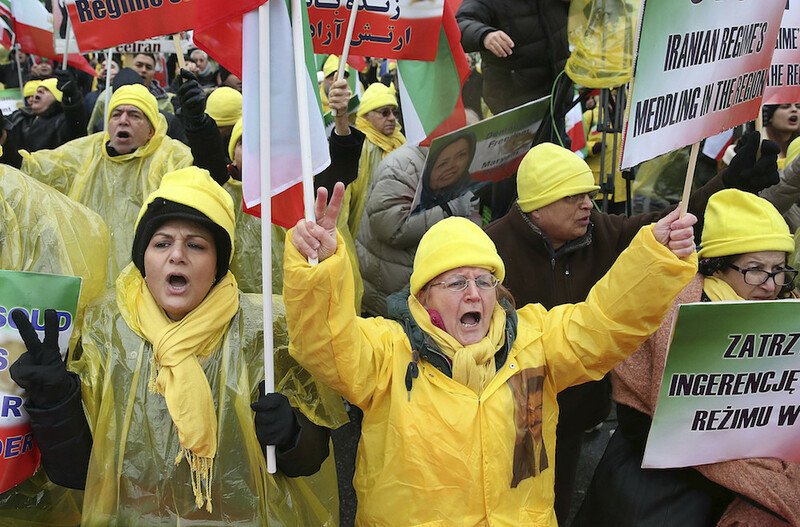 Ahead of the two-day meeting, hundreds of people took part in an Iranian opposition demonstration in Warsaw on Wednesday. Speakers at the event included the former New York mayor, Rudy Giuliani. “The Iranian regime has been facing a popular uprising in Iran for a year and has not been able, despite using all kinds of repression, to control or quell this uprising, so it has once again started to export terrorism to the world and plan terrorist operations,” Sanabargh Zahedi, Chairman of the Judicial Committee of the National Council of Resistance of Iran, told Arab News. Pressure has been growing on Iran since Donald Trump last year withdrew the US from a deal designed to curb Tehran’s nuclear ambitions. European powers stuck with the accord and their unhappiness at Trump’s move was reflected by a reduced presence in Warsaw. Israeli Prime Minister Benjamin Netanyahu and US Vice President Mike Pence will headline the conference on Thursday. Netanyahu is keen to build closer ties with Arab countries which share his concern of the Iranian threat in the region, particularly the presence of Iranian proxy militias in Syria where Israel carried out further strikes on Monday. “We are operating every day … against Iran and its attempts to establish its presence in the area,” said Netanyahu. Ahead of the summit he met with Oman’s foreign minister Yousuf bin Alawi bin Abdullah, in rare public talks with an Arab leader. The Omani minister said people in the Middle East have “suffered a lot” because they stick to the past. He said Wednesday's meeting reflects a “new era” for the region. The US is also hoping to make progress with a peace plan for Israel and Palestine. Trump adviser Jared Kushner will make a rare speaking appearance at the conference, possibly to offer hints of what the deal may include. “From weapons proliferation and humanitarian crises, to terrorism and energy security, these issues and others pose serious threats to stability in the region and to security around the world,” he said. British Foreign Secretary Jeremy Hunt, who is attending the event, said he wanted to focus on ending the crisis in Yemen, AFP reported. Hunt met Tuesday evening in Warsaw jointly with US Secretary of State Mike Pompeo and senior officials from Saudi Arabia and the UAE, which are both supporting the Yemeni government against the Iran-backed Houthis as part of a regional military coalition. Hunt said he hoped to expand on a seven-week ceasefire that has largely held in the crucial port city of Hodeida. “We now have a shortening window of opportunity to turn the ceasefire into a durable path to peace - and stop the world's worst humanitarian crisis,” Hunt said. The opening ceremony for the two day conference gets under way in Warsaw. Saudi Arabia's ambassador to the US, Khalid bin Salman, said Saudi Arabia joins the Warsaw Summit "to take a firm stand against forces that threaten the future of peace and security," in particular Iranian. "The Iranian regime has been facing a popular uprising in Iran for a year and has not been able, despite using all kinds of repression, to control or quell this uprising, so it has once again started to export terrorism to the world and plan terrorist operations. "We now want to confront this phenomenon and call upon the international community to take firmer steps against this regime." Israeli Prime Minister Benjamin Netanyahu meets Oman's foreign minister Yousuf bin Alawi bin Abdullah ahead of the Warsaw meeting. In a video released by Netanyahu's office, the Omani foreign minister, said people in the Middle East have "suffered a lot" because they stick to the past. He said Wednesday's meeting reflects a "new era" for the region.